Or listen live from anywhere at hoosierhistorylive.org! An entire region in east central Indiana became the setting in the 1880s and '90s for, as one of our guests puts it, "one of the great natural resource discoveries of American history." The Natural Gas Boom in Indiana also is regarded as one of the most dramatic eras in the state's history. Alas, the boom - which significantly affected cities such as Muncie, Kokomo, Anderson, Marion, Elwood, Gas City and Fairmount - did not last, even though many civic leaders, businesses and residents assumed the plentiful natural gas would never run out. For most industries, businesses and homeowners, the era was over by 1910 or much earlier. James Glass, a well-known historic preservationist and the co-author of The Gas Boom of East Central Indiana (Arcadia, 2005). Jim, who writes the popular "Culture Watch" column for The Indianapolis Star, is principal of Historic Preservation and Heritage Consulting. And Dave Broman of Kokomo, executive director of the Howard County Historical Society. The society is located in the Sieberling Mansion, a historic residence built by a prominent figure in the gas boom. According to our guest Jim Glass, Indiana's "gas belt" covered 2,500 square miles, making it the largest natural gas field in the country in the 1890s. 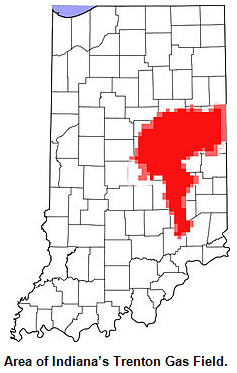 A range of industries requiring large quantities of fuel were attracted to east central Indiana as a result. They included glass (Muncie became the country's No. 2 glass-producing city after Pittsburgh, Jim writes), brick, wire and nail, iron and strawboard, an early type of cardboard. Without the gas boom, many historians are convinced Indiana would not have become a major industrial state. At the least, its transition from being an agricultural state would have been significantly delayed. So why did the Natural Gas Boom end so quickly? "No effort to conserve," Jim writes. "No one wanted to believe the gas would run out, despite plenty of scientific evidence." The boom essentially began at a gas well near Eaton, a small town north of Muncie. 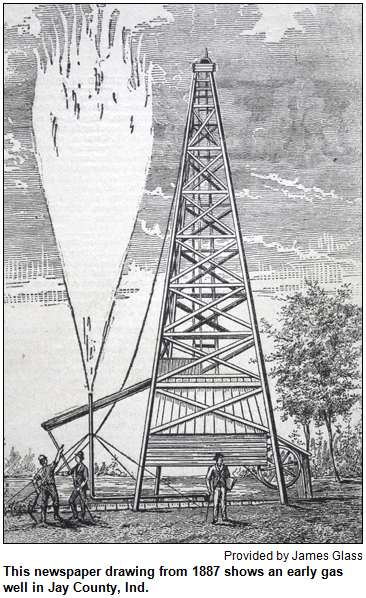 According to The Gas Boom of East Central Indiana, it became, as a result of drilling in 1886, "the first well in Indiana to produce a profitable supply of gas." As drilling quickly spread across east central Indiana, officials decided the best way to show off the output of a new gas well was to light it up. A resulting flame - known as a flambeau - become a common sight in the night sky. 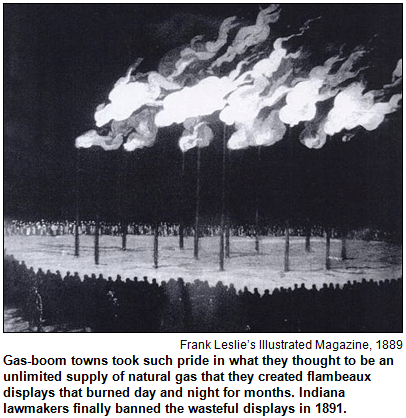 Flambeaux, burning night and day, often were regarded as community "billboards" for the abundance of natural gas. Towns like Muncie grew rapidly, with its Ball Brothers Company becoming the country's largest producer of fruit-canning jars by 1900. According to our guest Jim Glass, more than 100 glass factories may have been in operation between 1887 and 1901 in east central Indiana. Among them was a glassmaking business in the Howard County town of Greentown. The factory burned to the ground in 1903; in recent decades, Greentown Glass has become highly collectible. Today, glass manufacturers in Jay County in far-eastern Indiana and in Kokomo are among the last factories remaining from the Natural Gas Boom era. Both of our guests have connections to the region affected by the Natural Gas Boom. 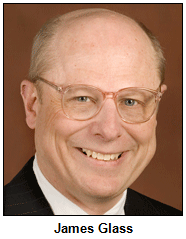 Dave Broman was born in Anderson and grew up in Bluffton, a town on the fringes of the Trenton gas field. 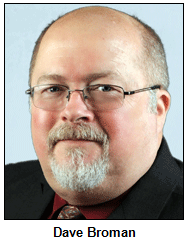 He worked in radio broadcasting in several cities, including Anderson and Kokomo. Since 2012, Dave has been executive director of the Howard County Historical Society; his goals include enhancing the explanations of the boom era - and the lessons that can be learned. A former board member of Indiana Landmarks, Jim Glass served as director of the Indiana DNR's Division of Historic Preservation and Archaeology. Promoters who touted their communities and enticed factories became known as "boomers." In addition to Howard and Jay counties, the gas boom primarily affected Delaware, Madison, Grant, Blackford, Hamilton and Tipton counties. Learn more: Our guests recommend watching this video, Fueling a Region: Indiana's Gas Boom, which was published in 2013 by WIPB Public TV in Muncie. "It may be best known to folks as that little town on SR135 you drive through on the way to Brown County. But it's nice to spend a few hours there to see what Morgantown has to offer. There are quite a number of restaurants for such a small village, but I recommend Kathy's Cafe, 159 W. Washington Street. Good, basic country cafe food, and really great pies, all homemade!" Morgantown is compact enough that you can simply walk around and enjoy its many historic buildings - most of the downtown is listed in the National Register of Historic Places - as well as its small-town atmosphere and its interesting jumble of local shops. There's a large antique store (the Antique Cooperative at 129 W. Washington) that is well worth a look, and the House of Clocks (75 W. Washington) maintains a sizable stock of clocks from around the world and repairs them as well. "Perhaps Morgantown's most unusual offering," says Glory, "is Graham's Bee Works, 125 W. Washington, a regional supplier of all things beekeepers need, including bees! As I have just become a beekeeper myself, this place, which had always intrigued me, has taken on new importance!" 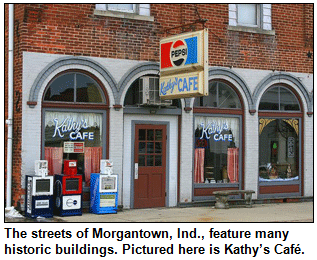 The Grant County town of Gas City was known as Harrisburg in the 1860s when the community was settled. With the discovery of natural gas in the area in 1887, Harrisburg, like many communities in east central Indiana, became a boom town. During the 1890s, the town changed its name to Gas City. Other towns across Indiana also have changed their names for various reasons. Among them was the town of Bethlehem. The town changed its name because another Indiana community also had the biblical name. The town that switched from Bethlehem to another name eventually became one of the fastest-growing cities in Indiana. Question: What is the city? The call-in number is (317) 788-3314. Please do not call into the show until you hear Nelson pose the question on the air, and please do not try to win the prize if you have won any other prize on WICR during the last two months. The prize pack is a gift certificate to the Rathskeller Restaurant in downtown Indy, courtesy of Visit Indy, four passes to the Indiana Experience, courtesy of the Indiana Historical Society, and two passes to Conner Prairie Interactive History Park, courtesy of Conner Prairie. Once again, Hoosier History Live! 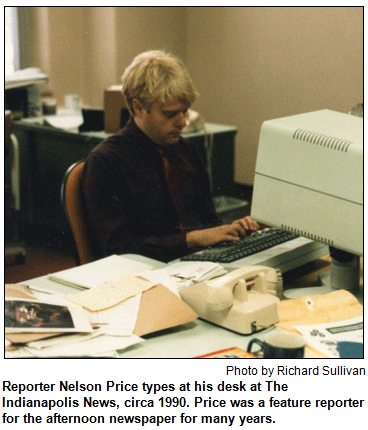 will turn the tables on our host, Indianapolis-based author/historian Nelson Price, open the phone lines and invite listeners to call in with questions about our Hoosier heritage. Nelson, who calls himself a "garbage can of useless Hoosier trivia," will be joined in studio by his collaborator on many projects, photographer extraordinaire Garry Chilluffo of Chilluffo Photography. 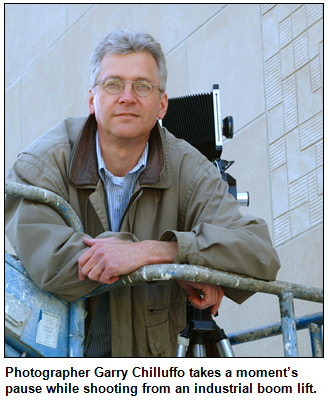 Garry, whose specialties include architectural photography, collaborated with Nelson and photo historian Joan Hostetler on Indianapolis Then and Now (Thunder Bay Press), a popular visual history book about the evolution of the Hoosier capital. 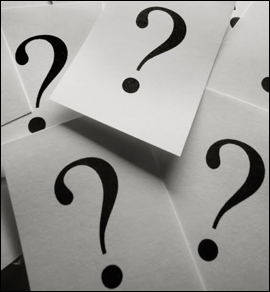 So in addition to calling Nelson with questions - the WICR-FM studio number is (317) 788-3314 - listeners also are encouraged to ask questions of Garry, whose expertise includes many aspects of transportation history. During the show, Garry plans to share insights about the trolley system that once flourished in Indy, drawing from the book Indianapolis Railways (Pioneer Press of West Virginia) by the late Jerry Marlette. Between phone calls from listeners, Nelson and Garry will share insights about sites featured in their Then and Now book, as well as about famous Hoosiers whom Nelson has interviewed or researched - and some of whom Garry has photographed. They include maestro Josef Gingold, the founder of the International Violin Competition in Indy. 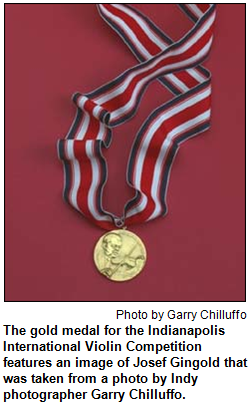 Garry photographed Gingold (1909-1995), a distinguished professor at the world-renowned Indiana University School of Music, so the maestro's features could be embossed on the gold medal now given to winners of the violin competition. Professor Gingold is among the more than 160 historic and contemporary notables featured in Nelson's book, Indiana Legends: Famous Hoosiers from Johnny Appleseed to David Letterman (Hawthorne Publishing). The airline/violin anecdote is relevant because of the recent contretemps involving Indianapolis Symphony Orchestra concertmaster Zach De Pue and a commuter airline that initially refused to let him bring his historic violin aboard. During the show, Garry will share insights about the historic Wholesale District in the south portion of downtown Indy, an area that includes Union Station, where dozens of retailers sold produce and other wares. Garry also will share details about Lockefield Gardens, which opened in 1938 as the first major public housing project in the city. Among the notable Hoosiers who grew up near Lockefield Gardens is a legendary athlete included in Nelson's books: Oscar Robertson, who led Attucks High School to back-to-back state championship titles before his outstanding career as a college and pro player. And Nelson will discuss his multiple interviews over the years with a Crawfordsville native who will be named a Living Legend by the Indiana Historical Society next month: Crossword puzzle guru Will Shortz, puzzle-master of the New York Times and author of many crossword books. Will, who became the first (and, so far, only) person to graduate from IU with a degree in enigmatology (the study of puzzles), grew up on a horse farm near Crawfordsville. Moving from games to historic fun, Nelson and Garry also will discuss the bygone Riverside Amusement Park that flourished for decades on the westside of Indy. Call in and ask Garry what's on the site today of the former carnival rides, which included a Ferris wheel and dueling roller coasters. Garry photographed the current site for the Then/Now book to accompany text by Nelson, who wrote about the amusement park by drawing on boyhood memories of growing up during the waning era of Riverside, which closed in 1970.